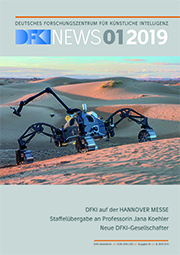 In: Information Fusion 50 Seiten 112-125 Elsevier 10/2019. In: Semeval-2018 Task 7: Semantic relation extraction and classification in scientific papers.. International Workshop on Semantic Evaluation (SemEval-2018) befindet sich NAACL June 5-6 New Orleans LA United States NAACL 6/2018. How Robust Are Character-BasedWord Embeddings in Tagging and MT Against Wrod Scramlbing or Randdm Nouse? In: Proceedings of the Conference of the Association for Machine Translation in the Americas. Conference of the Association for Machine Translation in the Americas (AMTA-2018) The13th Biennial Conference Organized by the Association for Machine Translation March 17-21 Boston MA United States 2018. In: Third Workshop on Computational Approaches to Linguistic Code-switching. Workshop on Computational Approaches to Linguistic Code-switching befindet sich ACL 2018 July 19 Melbourne Australia ACL 2018. In: 1st International Workshop on Artificial Intelligence for Question Answering. International Workshop on Artificial Intelligence for Question Answering (AI*QA-2018) befindet sich 22nd European Conference on Advances in Databases and Information Systems (ADBIS 2018) September 2-2 Budapest Hungary Communications in Computer and Information Science (Springer) Springer 2018. In: Proceedings of the 15th Conference of the European Chapter of the Association for Computational Linguistics (EACL) 15th Conference of the European Chapter of the Association for Computational Linguistics- Proceedings of Conference, Volume 1: Long Papers. Conference of the European Chapter of the Association for Computational Linguistics (EACL-2017) April 3-7 Valencia Spain Seiten 505-5013 1, Long Papers ISBN 978-1-945626-34-0 Association for Computational Linguistics (ACL) 4/2017. In: Alexander Maedche, Jan vom Brocke, Alan Hevner (Hrsg.). Designing the Digital Transformation. International Conference on Design Science Research in Information Systems and Technology (DESRIST-2017) 12th International Conference on Design Science Research in Information Systems and Technology May 30-June 1 Karlsruhe Germany Seiten 21-38 Lecture Notes in Computer Science (LNCS) 10243 Springer International Publishing 2017. In: Proceedings of IEEE International Conference on Big Data. IEEE International Conference on Big Data (IEEE BigData-16) IEEE BigData December 5-8 Washinton, DC DC United States IEEE 12/2016.